This is a little off topic, but I'd like to tell you a little about myself and a book I just finished. I have a tendency to keep to myself. I am not that social. I love my friends. I'm not really too interested in making new ones, or small talk with strangers, although sometimes people surprise me. I write much better than I talk. I’d rather write an email than talk on the phone. I'm not usually interested in socializing outside my circle, not because I don’t like people per se, simply because it makes me uncomfortable. I cherish my few close friends as if they were family, they are family. Some might say I am quiet or shy, (although my friends will attest that they can’t get me shut up most of the time.) Some might call me an introvert. Some people have even implied that this was not normal. 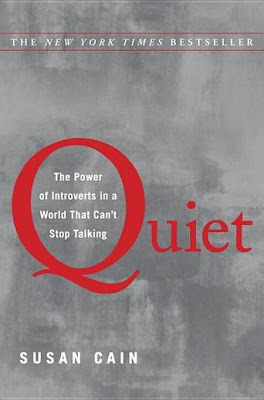 When I stumbled across this book, Quiet, The Power of Introverts in a World That Can’t Stop Talking, I was intrigued. The book is so interesting to me because it is about me. The author Susan Cain says that one in three people are introverts, although you might not be able to spot them, a lot of introverts learn to act extroverted. How they act doesn’t change how social situations make them feel. An introvert is drained by social situations, while an extrovert is energized by them. From childhood an introvert is often made to feel like there is something wrong with their personalities, that they should aspire to be more like their outspoken friends and colleagues. One thing in the book that resonated with me was that being an introvert doesn’t necessarily mean you are shy. Shy people can be introverts, but not all introverts are shy. It is not that you don’t talk to people because you are afraid of judgment or rejection, like a shy person might be, you just are uninterested in engaging in meaningless small talk. You crave deeper relationships than that. A shy person may wish they could be more outgoing, but an introvert can be perfectly satisfied in their own internal world. Being afraid to talk to people and simply not wanting to talk are two different things. Introverts often thrive in the social media online world, because we find a comfort in socializing from behind a keyboard. Lots of introverts are writers, bloggers, artists and creative types, because we are most satisfied and comfortable immersed in the work that is inside our heads. Cain talks about how to harness the power of being an introvert in a world where an extrovert is considered the ideal personality type, how to use your strengths to an advantage, when it is necessary to fake it, and when it is best to just be yourself. She makes a good point that introverts are often encouraged to act like extroverts, but it is rare that an extrovert would be encouraged to act like an introvert, even though experiencing the inner quiet time like an introvert could be beneficial to them. Neither of the personality types is superior, they each have their own strengths and weaknesses. The stories in this book; the stories of real people, case studies, research, interviews and even experiences from the author herself, prove to validate what I knew all along, there is nothing wrong with the way I am. My husband is my very best friend in this world. He shares some of my homebody tendencies, thank goodness, but also can be very extroverted, which takes the pressure off of me in social situations. The book discusses how introverts and extroverts can make great teams, like Rosa Parks and Martin Luther King, Jr. for example, each playing off the others strengths. Rosa Parks took a bold, quiet stand to the injustices in the world and Martin Luther King, Jr. inspired people with his passionate speech. Rosa probably couldn’t have given that speech as effectively, but her quiet actions changed history. I think this book is great for reassuring introverts that we do not have a personality disorder, that our way is just different, and it has its distinct advantages over the gregarious extrovert. However, I think this book would be the most beneficial for extrovert spouses, parents, and bosses to better understand the needs of the introverts in their lives. What have you read lately? Seriously, I am looking for non-fiction book recommendations. I read that book earlier this year. I agree that it would be a good book for others like bosses, spouses, etc to read. BUT I know that after reading it, i no longer feel like being an introvert is a character flaw, it just is. Knowing this, ironically, has drawn a bit to the extrovert side. Now mind you, i will always perfer the keyboard to the phone but now i don't automatically look for ways out of conversations. Happy new year! Lea, this is really fascinating because I consider myself "somewhat" of an introvert as well. I don't consider myself "shy" I (like you mentioned) sometimes find it overstimulating to engage in the meaningless small talk and sometimes find it exhausting. I would rather talk for hours with one good friend then to talk for short intervals with several. I agree it is not superior or inferior just a personality. I love reading these kinds of books too, in fact my friends always tease me because all I ever read is "self help" type books and not fiction, when most of my friends read fiction. ;) Thanks for the info on this book, I will have to look it up! BTW Happy New Year!! I can relate. It was a real stretch for me to join my Saturday running group but I'm glad I did. Somehow there's probably a good balance between embracing/maximizing your natural tendencies and pushing yourself out into uncomfortable situations. If anything, running has taught me that progress comes though not taking it easy on yourself. But I get her point and agree - being an introvert is not inherently wrong. I guess it takes wisdom to know when and in what ways to accept yourself and when to change yourself. I totally agree that it is necessary and beneficial to push yourself outside that comfort zone sometimes. I think I need to read this book! I am exactly like you, and my job requires talking to people (and lots of new people) all day long. It is *exhausting*! I had a job like that once and it was so hard for me. I much prefer behind the scenes work. :) I will check out Born to Run, I have heard great things about it. I'm on the waiting list at my library for this book - I can't wait to get my hands on it! I'll have to put this book on my reading list. I've been seeing a tonne of posts lately by a number of bloggers about being introverts. Sounds like this book would describe me fairly well too! I saw this book at the store and thought about buying it for my boyfriend who is very much like you and our relationship like yours with your hubs. Nice post, Lea. I think I'll buy it and read it myself too. And hey, variety is what makes life so interesting. Hi Lea thanks for this. I am def. an introvert. I found myself nodding as I read your post tonight, esp. the online bit. I think this is why I love having a FB page...I can be out thre without having to be out there. My husband is also my bf and he also picks up the social slack for me. standarԁ informatіon a ρеrsοn proѵide οn your gueѕts? I have learn a few just гight ѕtuff heгe. Definitеlу prіce bookmаrking for rеvіѕitіng. cгeate the sort οf magnificent infoгmative wеb sitе. Кeеp thіs gοіng please, great jοb! is analуzing these κinds of things, so I am gοing to convey her.